Since I don't personally know anyone else who makes their own fishing lures, I was wondering how others attach screw eyes to their crank baits and when. I usually save it for the end and dab a little bit of gorilla glue to the tip before screwing them in. I've caught bass to muskie doing so without any failures yet. Personally, I prefer the look and performance of hand-wound screw eyes. More glue surface and you can make them any length you need. I use stainless steel wire that is stronger but thinner than the typical chrome plated brass screw eyes, so it's also easier to mount/remove split rings on them. I drill a hole slightly larger in diameter than the screw shank and push epoxy into it with a piece of ss wire. Then I butter the screw eye with epoxy and push it into the hole. Ok, some of the stuff we do is probably overkill but bait builders have a habit of wearing a belt + suspenders. It's not a bad habit. I do the same as Bob. I use a loose barrel twist and fit before paint, so that I have something to hold. Include me in with the guys that use the barrel twist. I don't like how thick the screw eyes are. To me it takes away from the look of the bait. On bass size lures anyway. The only problem with the wire twist shown in the video is that it's not a barrel twist. A barrel twist is made by holding one wire in a pair of pliers, or other holding device, and wrapping the other end of the wire around the first wire. A barrel twist provides greatly improved holding capability over a simple twist. The barrel twist will look a lot like a threaded screw and gives the epoxy plenty of area to form a bond with. You'll see what I'm talking about in the photo below. The normal twist, shown by Hillbilly1 has been used for many years with no drama. No one has complained that the design has let them down, so it works and is an accepted method. I chose to use the loose barrel twist (introduced by Hazmail), because my pull tests demonstrated a significant improvement. For convinience I most likely use screw eyes , ......but whilst writing a lurebuilding essay in a German angling magazine years ago I've once utilized such eyes as well , as lure screweyes are not generally available in Germany . Before publishing thís method , I had to test it , off course , ...........assembled one with approx. 1" shaft length into the end of a piece of broomstick , throroughly applied my epoxy glue into the bore(eye's shaft should sit flush to be able to be twisted in)and on the shaft and carefully twisted in the eye , so that the wet glue would reach every single spot . After three days of curing time(my glue reaches highest bonding power after 72 hrs.) I made a pull test by clamping the broomstick piece into a vice real firm , used a piece of cord and my fishing scales and pulled on the eye linear(paralell to the the eye's shank) , ..............at 23 kilograms pull(around 50lbs) the cord snapped , .....due to the sudden release the scales spoiled as well , .........but the eye of 1,0 mm stainless welding wire did not move a bit ! Under fishing conditions the pull directon on the eye's shaft would most likely not be linear , but under a certain angle more or less , ..........thus the eye would even handle more pull weight ! I've used both sst twist wire and sst screw eyes. For me, if the lure body material is strong enough, I use the screw eyes, because they are faster and easier. I drill a pilot hole that's the same diameter as the screw shank that's left after the threads have been cut. I run the screw eye in, to cut the threads in the wood or PVC, and then run it back out again almost all the way. I coat the threads with brush on crazy glue, and run the screw eye back in, using any glue that has built up around the entry point to "seat" the eye, so it is locked in whatever orientation I want. I've never had a screw eye turn, or back out, using this method. For balsa baits, I run the screw eye in and back out again completely. I use a drop of runny crazy glue to reinforce the wood threads in the hole that the screw eye cuts before I run it back in with the brush on glue, which is thicker and takes longer to set. When I use twist wire, I use the regular twist like in Hillbilly's video. The only time I had one "unscrew" was when I used 5 min. epoxy to seat it. After I switched to D2T I never had another failure. I have to admit I have never done the kind of pull testing that Vodkaman and Diemai have done. I'm too lazy. I know that the screw eye, once I've installed it, requires a pair of pliers to break it loose so it can be unscrewed. So I know that the connection is solid. Even with balsa baits, by reinforcing the wood with crazy glue, my eyes are locked in. I don't have muskie or pike in my SoCal lakes, so I can't say if my method would work for them. But I suspect that my line would break before a screw eye or twist wire would pull out. I wasn't trying to bash Hillbilly1's method. Sorry if it came across as such. I just wanted to clarify what a barrel twist was. I did a little testing of my own and found the barrel twist to be a much stronger connection. In my test at least. I took a block of wood and epoxied a hook hanger formed with the simple twist. After allowing the epoxy to cure it was hung up with a 15 lb. weight attached. In less than 24 hours the hanger pulled free from the wood block. This same test was done again with the same results. Just double checking to make sure there were no mistakes the first time around. The test was done again with everything being the same except for the wire twist. The barrel test was used this time. After each 24 hour period with no failure more weight was added. I ended up with approximately 35 lbs. of weight hanging on a straight pull over a period of several days before it finally failed. And it wasn't the barrel twist or epoxy that failed. The wood itself is what finally gave way. When inspecting the connection after failure there were wood fibers still holding to the barrel twist that had been ripped free. To me this meant that the epoxy/barrel twist connection was stronger than the wood it was glued into. I have no doubt that it will be extremely hard, if not downright impossible, for a fish to exert that much force on a straight line pull. That doesn't mean I want to take that chance. I like to build my lures as strong as possible while still maintaining the desired action and overall appearance. I did a little testing of my own and found the barrel twist to be a much stronger connection. In my test at least. I took a block of wood and epoxied a hook hanger formed with the simple twist. After allowing the epoxy to cure it was hung up with a 15 lb. weight attached. In less than 24 hours the hanger pulled free from the wood block. This same test was done again with the same results. Just double checking to make sure there were no mistakes the first time around. Your pull numbers are similar to mine. Did you find that the straight twist left the glue behind? Would I use the same wire twisting pliers for both the straight twist and barrel twist methods or do I need separate ones? Both can be done easily by hand. The twisting pliers are good for the straight twist, but no use for the barrel twist. I did a barrel twist thread, but the pics are lost, I'll have to do a video. I say again, both methods are good. You choose. I don't have any specialty pliers that are used to form either the barrel twist or the straight twist. To form the barrel twist I use a finish nail driven part way into a short board that can be clamped to my work bench. After driving the nail into the wood the head is cut off so the wire can be removed after forming. 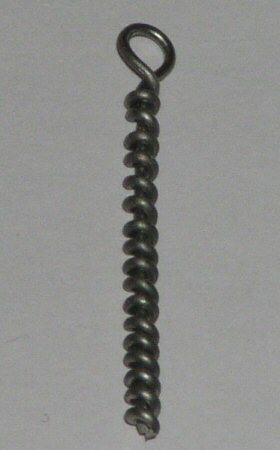 A length of wire is then bent double around the finish nail leaving one side of the doubled wire longer than the other. The long end will be wrapped around the short end. A pair of needle nose pliers are used to finish closing the loop that is made by wrapping the wire around the nail. The short end of the wire is then gripped with a pair of Vice Grip locking pliers and the needle nose are used to grip the other end of the wire and begin wrapping the long section around the short piece being held by the Vice Grips. Take a look at the picture of the barrel twist and I think you will see what I'm talking about. If you still don't understand the way the barrel twist is formed let me know and I can post more pics. One thing I forgot to mention is that the finish nail should be the same size as you want the loop of your hook hanger to be. To form a straight twist I use the same tools as used in forming the barrel twist. Only this time the wire is folded around the finish nail so that both ends are of equal length. The locking pliers are clamped onto the ends of the wire and I just start turning until I have the twist as tight as I want it. I'm sure there are other ways of doing this procedure. This is just the way that works for me. Maybe I've gotten lazy but nowadays, I just do the "twist both together" with vise grips screw eyes instead of using a barrel twist. None have failed in 6-7 yrs, so I'm feeling OK about it for bass baits. When you consider that bass rod guides are designed for a max of 10-12 lbs of dead weight before they begin popping off the rod, and most bass reels are set for 5-6 lbs of max drag, that suggests to me that we're probably safe with whatever screw eye we choose. Plenty of musky lures use commercial screw eyes. I use hand wound screws for esthetic reasons and because it's easier to put split rings on their smaller diameter wire without deforming the rings. They're easy and fast enough to twist up that I don't mind a couple of minutes extra work to make them. OK, now I gotta admit that maybe I don't always use a belt + suspenders. But my pants haven fallen down around my ankles yet, either. Its all good Iv done just a strait twist I might have to give the barrel a try. I use a apple peeler that is modified and a pair of twist pliers. the twist pliers really keeps the loop in a much flatter plain than the nail way. IMOA, but thats just me. been using it now for 6 yrs and I use CA glue to glue in my line tie and hook hangers and so far so good! Here's a video of how I make the loose barrel twist eyes. You will have to reverse everything, as I am left handed. Great video!! So much easier than words. Thanks Vodkaman. thanks Dave I like the video! A left handed engineer! That explains a lot! That's a neat wire twist setup. What kind of wire are you using? All the sst wire I get still has some temper, so it's a bear to twist. Thanks to everyone for sharing your info and knowledge! As always you guys are very helpful. Only one more question and we can move on to something else. What kind of wire do you guys use? I tried some piano wire and made a few but it seems to be way to stiff. Left handed engineers are wired differently which makes them all a little strange. I am OK with this. The wire in the video is quite thin, 0.031" diameter. I am building a bunch of small cranks at the moment. I am not absolutely sure what the spec of wire is, either SS 304 or 304L. The grades of Stainless Steel wire that you should be looking for are: 304 : 304L : 308 : 316 : 316L all these SS wires should be fine for lure building. If your wire has spring back and seems overly stiff, it may be 400 series, which is the wrong choice. The 300 series wires are more corrosive resistant and soft. Here is a very recent discussion on wires that contains a lot of useful information.